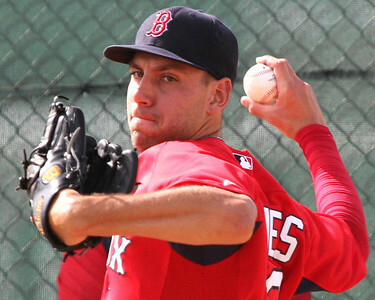 Matt Barnes (pictured, below) rejoined Pawtucket this week after starting the season in extended spring training. Barnes made his first start on Friday, and tossed five innings against the Rochester Red Wings (MIN), allowing two runs (one earned) on six hits and two walks, punching out a pair. SoxProspects Managing Editor, Matt Huegel, recapped the start in his ESPNBoston feature. In Monday's action, the Portland Sea Dogs turned a rare around-the-horn triple play. Sea Dogs broadcaster Mike Antonellis uploaded video of the play on his YouTube page. A pair of Red Sox prospects made this week's Baseball America's Prospect Hot Sheet. 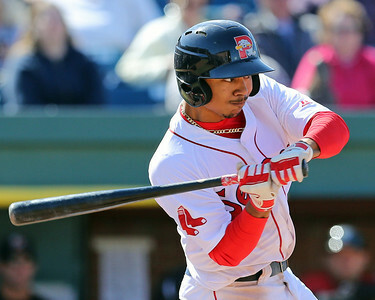 Mookie Betts has reached base in 54 consecutive games through 4/27 and is currently ranked the #3 overall prospect in the Boston system by SoxProspects.com. Brian Johnson has been impressive in his last two starts for Salem, tossing 12 innings over two starts, just four hits and a walk while striking out 13. The Salem Red Sox will celebrate the 75th anniversary of the first baseball game played in Salem on May 20th with a "Turn Back the Clock Night" as they square off against the Winston-Salem Dash (CHW). The game will feature reduced ticket prices and concessions along with the Red Sox donning special throwback jerseys.